In this installment of our Mental Health Resources column, we’re shining a light on the best anxiety Twitter accounts. Having positive, informative, and useful content on social media can make a world of difference for those of us living with mental illnesses. For people who have friends and family members living with anxiety diagnoses, the following recommendations may prove especially helpful to improve understanding and provide resources to best support our loved ones. 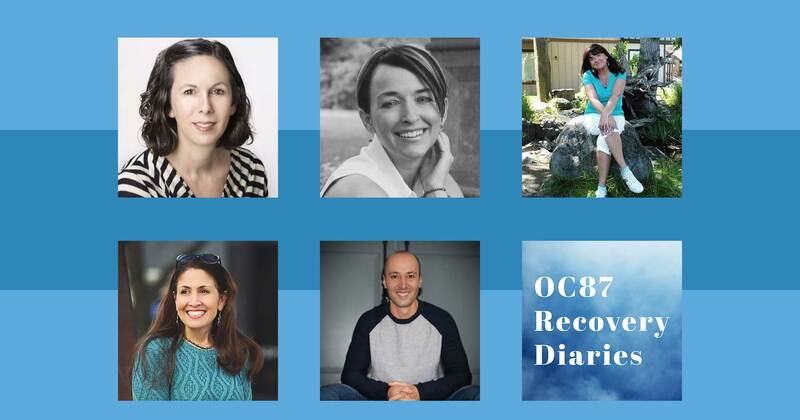 As always, OC87 Recovery Diaries is committed to our shared cause to #buststigma around mental health issues. We encourage you to follow us on Twitter @oc87rd, and to leave a comment with any other social media accounts you’d like to see featured in future columns. Therapist Natasha Daniels shares information for parents, caregivers, and educators who are involved with children living with anxiety and obsessive-compulsive disorder. It’s uncommon to see resources focused on mental health in young people in mainstream social media streams, which makes @anxioustoddlers stand out. 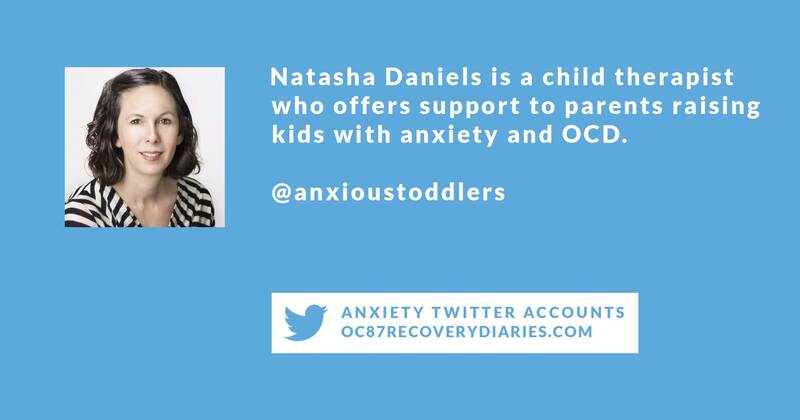 On her anxiety Twitter account, Natasha shares links to original blog posts and YouTube videos on topics including how to guide your child through a panic attack, navigating bedtime routines, and how to support children through their various fears. In addition to content centered on very young children, Natasha also shares content for navigating anxiety challenges with teenagers. 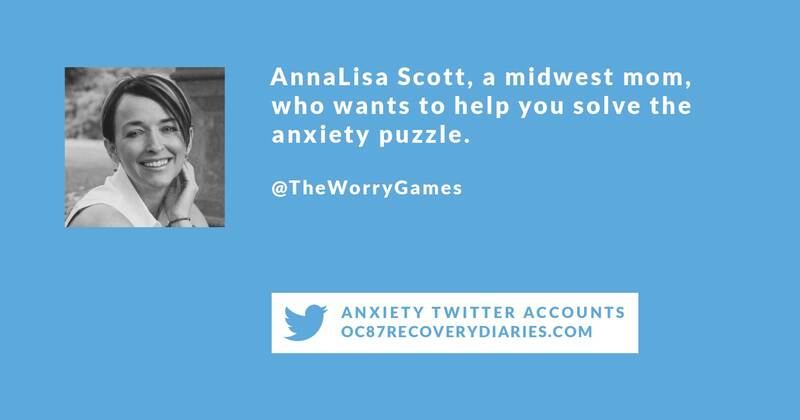 As a companion to her popular anxiety Twitter account, AnnaLisa Scott runs a personal blog where she shares honest accounts of her life long journey with an anxiety disorder in order to bust stigma, create community, and share resources around recovery. The Worry Games Twitter feed is packed full of links to her powerful blog posts, retweets from other people living with mental health challenges, and simple suggestions for ways to navigate anxiety on a day to day basis. Be advised (if it’s not your thing or if it’s your great passion on social media) AnnaLisa does not shy away from tweeting about current events and politics, since those topics deeply impact her mental health. 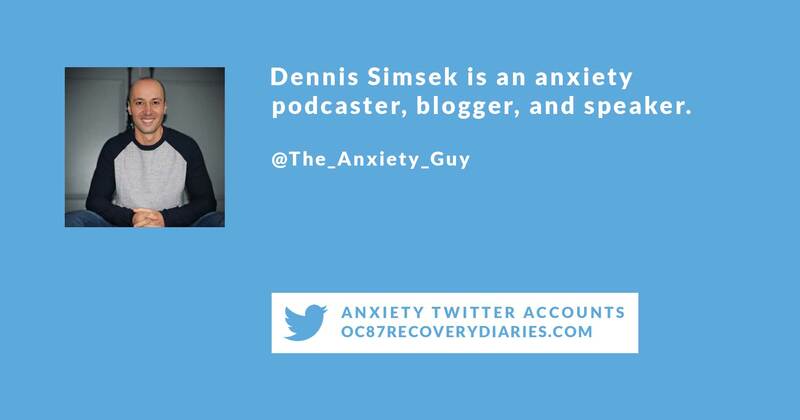 Dennis Simsek hosts the #1 anxiety-focused podcast on iTunes called, you guessed it, Anxiety Guy Podcast. His anxiety Twitter account shares new episodes, short messages of the day, original videos, and retweets from other mental health advocates. 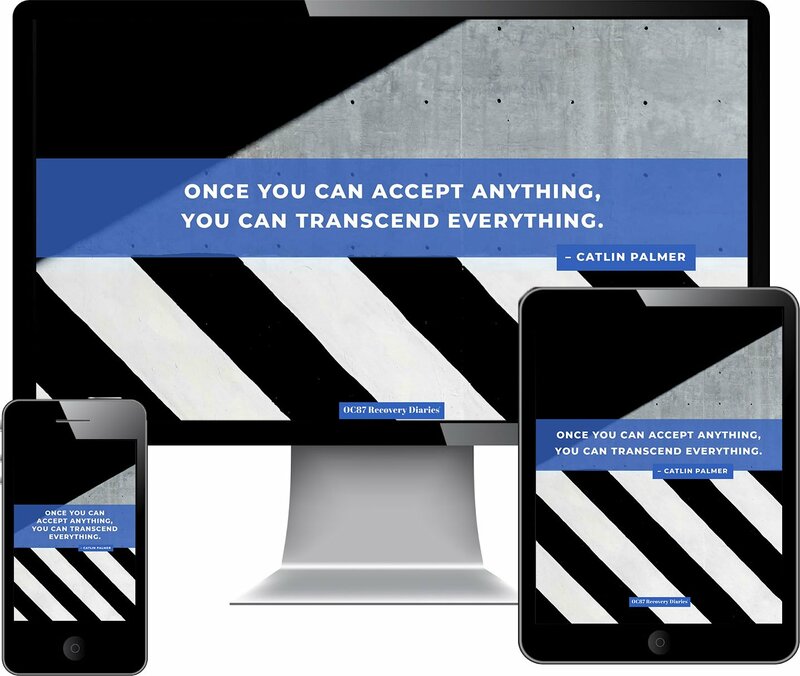 Dennis’ tone online is approachable, encouraging, and packed with value. A mix of science reporting, vulnerable sharing, and anecdotes from the day in the life of a guy living with anxiety, this Twitter feed is a must follow for friends and family members of those living with this diagnosis. 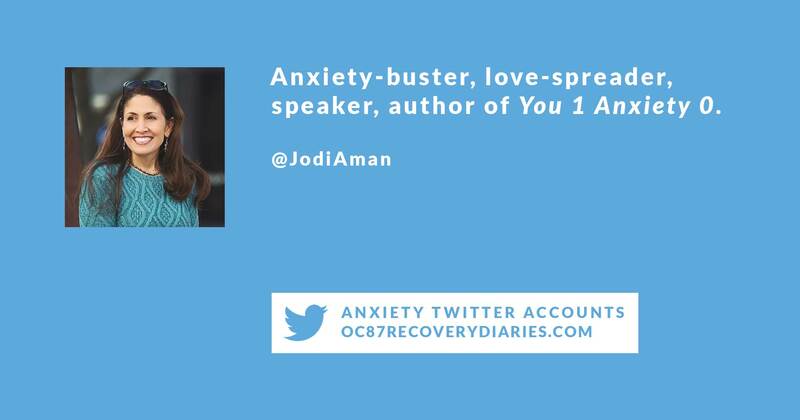 Jodi Aman’s anxiety Twitter account is a great one to follow for an influx of recovery-related content in your feed. Posting often and on topic, Jodi’s Twitter world is filled with links to original videos, relevant current event news, and a range of “how to cope with anxiety” blog posts. With a straightforward, kind, and positive outlook, Jodi’s account is a good follow for people living with anxiety as well as our loved ones who want to understand more about life with this diagnosis. This feed is original Twitter to its core: all text tweets (very rare to see a link, photo, or video here), and all personal observations about life. In this case, the life shared is that of a woman living with anxiety and bipolar disorder, who tweets candidly about her day to day thoughts, challenges, and accomplishments. 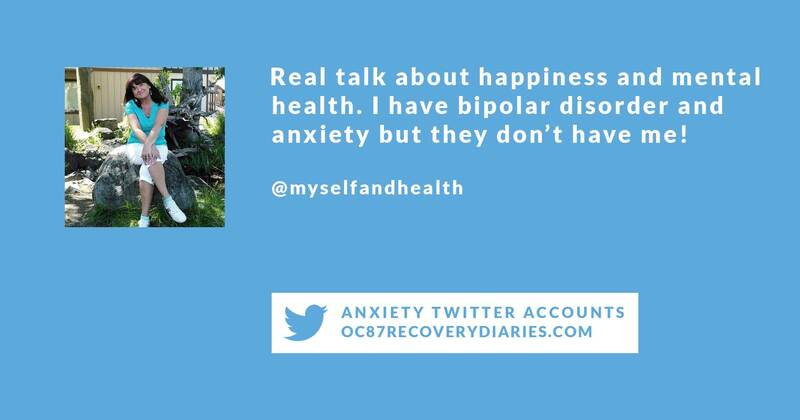 The @myselfandhealth anxiety Twitter account is hugely popular for that reason; it’s all down to earth, honest content that gives a great view into a life lived with mental illness, encouragement, and change.